Nos ha parecido estupenda la excursión con Luigi, que alternaba el inglés y el español con soltura, y contestaba a nuestras preguntas con conocimiento. Orazio is an awesome guide. We felt like we were with family on this tour! He was knowledgable about the sites and spoke great English. This tour was the highlight of our trip! I recommend this tour! Our full day trip on 15.10.2018 Etna and Taormina was excellent. Our guide was knowledgeable, cheerful and caring, "Crazy Driver". She told a lot of interesting details about the history of Catania, Etna, Taormina and Sicily.She was very concerned about her group and she was very helpful. Unfortunately, the weather at the Etna peak was foggy, so we left without great views down to sea and valleys. 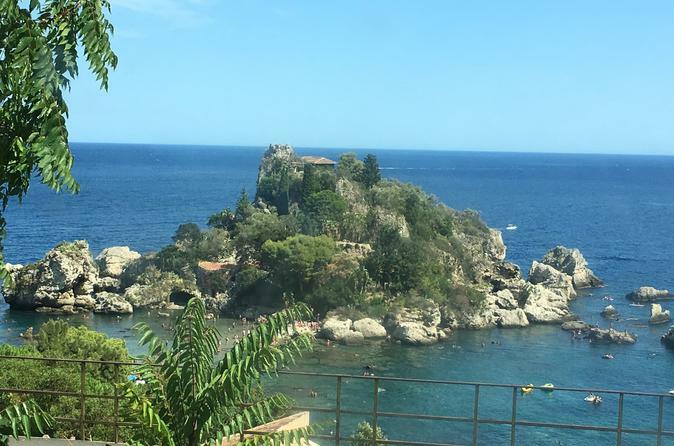 The visit to Vulcanic cave was interesting and the sightseeingtour in the sunny Taormina was great and good value for money. Imagine our surprise that EtnaTribe operated our tour and we were the only two on it! Very very kind of them. Carmelo was extremely friendly and attentive, and knew when to back off to let us have time to ourselves to enjoy. He was very informative about all things Etna, and the weather was great so we went up to 3000m! Wear a hoodie or bring a scarf to protect Your ears, is my advice. After descending we were off to Taormina, a quaint sea side town to wander around for 2 hours or so. A very memorable day, thank you Carmelo! Our tour guide was very knowledgeable. We learned more about Mt. Etnea from him, then we did on Etna. Our tour guide Andreas was very informative. Enjoyed the tour to mount Etna and loved spending time in Taormina. Tour well worth it! We only had a couple of days in Sicily, so this tour was perfect for us. Our guide Enzo was excellent - he was very passionate about his beloved Mt Etna, and Sicily. He was very knowledgeable and explained everything well. Our group had four couples, which was a good size. Enzo picked up the four couples from our hotels. We started our day at Mt Etna. I was nervous about visiting the mountain as I have asthma and haven't travelled up this high before, but Enzo was a great help and I was fine!. Our group decided to stay at 2000m, so Enzo took us around the crater, explaining how Mt Etna was formed, and let us have some free time to walk around and buy souvenirs. It was a little windy but not too cold. Enzo then took us inside a lava cave and provided helmets - it was very interesting. We drove to a small village on the side of Mt Etna, where we tasted lots of different olive oils, pastes and wines. Afterwards we went to Taormina, which was a beautiful town. Enzo gave us about 2.5 hours of free time, which let us have lunch, walk through the streets, get ice cream and also see the greek theatre a must see - the views are amazing!. Then we were dropped back at our hotel at about 5pm. This tour was the highlight of our trip to Sicily and we would highly recommend. 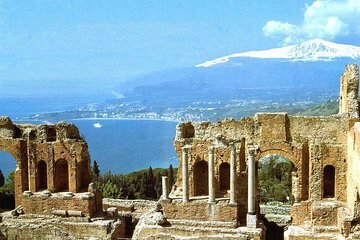 We learnt so much about Mt Etna, Taormina, Catania and Sicily. Thanks Enzo! Giulia is one of the best tour guides you can imagine - highly knowledgeable, proficient in several languages, full of energy and enthusiasm. There's no question left answered - they go out of their way to make the tour as exciting and enthralling as possible. Hiking up Mt Etna is quite the experience, get ready for quite an awe-inspiring and memorable tour!